A special 2015 tee shirt has been produced, thanks to sponsorship from Mercedes- Benz, Blackpool, to be given to all taking part on Sunday. The “Fun Run” is being started at 10am by rugby and TV celebrity Bill Beaumont CBE from the station’s Inshore Lifeboat Boathouse on Central Beach, Lytham and will finish at the station’s All-weather Lifeboat Boathouse on South Promenade, St Annes where a BBQ, as well as drinks and cakes, will be available to restore any inches lost by the runners and helpers. Anyone who feels they do not wish to take part in the run is more than welcome to come along to encourage the participants and meet the lifeboat crew, view the station and All-weather Lifeboat or just enjoy the atmosphere. It is hoped that the Day will be as great and as much fun as last year’s event was. or entry forms are also available at the Station’s two Boathouse Souvenir Shops. 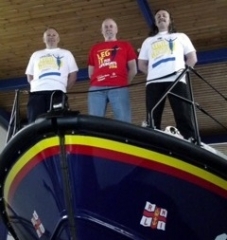 The cost for adults is £10 and for children £5 which goes towards the sea rescue charity’s role of saving lives at sea.